With over 100 caps for the Scottish national side, the arrival of Suzanne Grant at Fir Park was an incredible coup for the Motherwell ladies team. From playing football in a boys’ team until the age of 17 to playing with, the most successful side in English ladies football, Arsenal, Suzanne has enjoyed a fantastic career at the top-level. 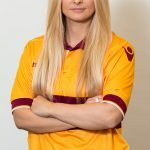 Motherwell ladies striker Suzanne Grant says she’s overwhelmed at the support she and her team-mates have received since clinching their second successive title. The ‘Well ladies were crowned SWFL1 (South) champions last weekend and now will compete in SPL2. 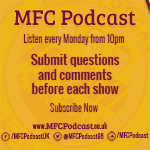 Along with Sparra and Jay, Motherwell Ladies striker Suzanne Grant and ‘Well fan Craig Holmes feature on this week’s podcast. Topics of discussion include the fantastic 4-1 win over Ross County, Mark McGhee, Lee Lucas, Motherwell Ladies’ league title win, the new era of fan-ownership at Fir Park, and Dundee Away on Saturday.